A Result of Noah’s Flood? Late one summer’s afternoon in 1901, a cowboy named Jim White was riding through the arid foothills of the Guadalupe Mountains in south-east New Mexico. Suddenly he was startled by a huge black cloud rising from the ground in front of him. He reined his horse to a stop. This cloud was not like any he had seen before, so he decided to see what made it different. As he galloped closer, Jim realised this funnel shaped cloud was formed by a massive swarm of bats! Millions of them were spiralling out of the sandy hillside. Jim was puzzled. What were so many bats doing here? Where did they come from? He resolved to find out. With a battered kerosene lamp and a rope ladder, Jim descended deep into a hole he found in the mountain side. He found tunnels and passageways. Warily he followed one tunnel. Soon it led him to the bats’ resting place. The floor was slippery with bats’ droppings. Cautiously Jim crept back. He followed another passage. Before long this tunnel opened up to reveal something amazing. In the flickering light of his lamp, Jim realised he was in an enormous room. He could see huge stone ‘icicles’ hanging from the high ceiling. Great pillars rose from the floor. Slender sticks of stone were everywhere, and in a far corner he could just make out a pond with stone ‘lily pads’ floating on its surface. It looked like Ali Baba’s cave - only these treasures were in stone. Over the following years, Jim found miles of connecting corridors in the cave, and bigger and more beautiful limestone chambers. His cave was like a glorious stone palace. Jim White, the ‘limestone cowboy’, had discovered Carlsbad Caverns, the most spectacular cave in North America, and one of the most spectacular in the world. Carlsbad Caverns’ largest room, called the Big Room, is so large it could contain almost 50 basketball courts. In one area the ceiling is higher than a 30-storey building. In 1924, US President Calvin Coolidge declared these spectacular limestone caves a national monument. But how did such beautiful limestone caves form? When did their formation occur? Did they really form over huge time spans? 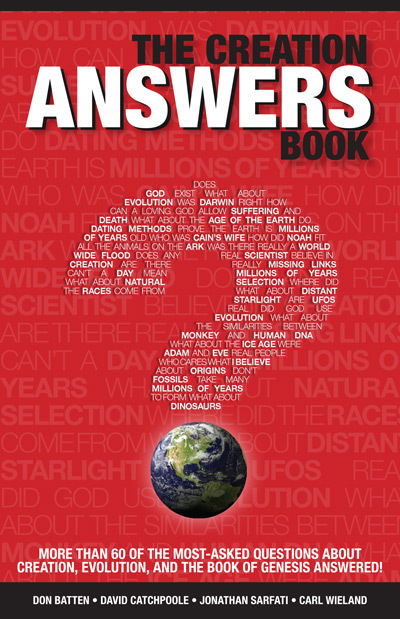 Or can they be explained in the framework of Noah’s Flood not many thousands of years ago? That many limestone caves formed by the solution process is indicated by four types of geological evidence. 1. Modern limestone caves often show evidence of ongoing solution - the chemical composition of groundwater leaving caves often confirms this. Continually growing stalactites and stalagmites within caves prove that solution is occurring above the caves. 4. Caves resembling those found in limestone do not occur in insoluble, non-limestone rocks. The apparent causal relationship implies that some characteristic of the limestone (i.e. its solubility) has affected the occurrence of the caves. That solution therefore is a major factor in the formation of limestone caves appears to be well substantiated. Most geologists, however, would believe that these solution processes take millions of years to form caves. But millions of years are not necessary for limestone cave formation. Geologist Dr Steve Austin, of the Institute for Creation Research in San Diego, California, has studied water chemistry and flow rates in a large cave-containing area in central Kentucky. He concluded that a cave 59 metres long and one metre square in the famous Mammoth Cave Upland region of Kentucky could form in one year!5 If even remotely similar rates of formation occurred elsewhere, huge caverns obviously could form in a very short time. So how could limestone caves form, using a catastrophic model of earth’s history which includes acceptance of a world-wide Flood? The problem is of course that we are attempting to understand the origin of limestone caves for which the evidence of the events forming them has been largely removed. But this problem confronts all scientists endeavouring to explain the formation of limestone caves. Nonetheless, there would be general agreement over the processes of formation, but not the rate of formation. Dr Austin’s studies, plus our own, convince us that the following model for limestone cave formation is entirely feasible within the short time framework of a recent worldwide catastrophic Flood, based on the available verifiable evidence. First, the limestone layers have to be laid down. Dr Austin believes most major limestone strata accumulated during the Flood. (7) The primary reason for this belief is that most of the major limestone strata either contain large numbers of catastrophically buried fossils (often corals and shellfish) or are in a sequence of other strata that contain large numbers of catastrophically buried fossils. As a layer of lime sediment was deposited, it would have been buried rapidly under huge amounts of other sediments. The weight on top of the lime sediments would compact them, and tend to expel the water they contained. Fluid pressure in the sediments would have been great, but lack of a direct escape exit would retard water loss and tend to prevent sediments from completely drying out and thus slow down the process of turning to stone. The major water loss would probably be through joints (internal cracks) formed while the sediments were hardening. Second, as the Flood waters receded, uplift and other earth movements would have occurred as implied by the statements in Psalm 104:6-9.8 Thus such earth movements would fold and tilt the sediment layers all over the earth so that concurrent and subsequent erosion would have worn the upper layers down to a new level. The layers of lime sediments would now again be near the surface. Continuing earth movements would cause movement on the joints and build up fluid pressure; the removal of the overlying sediment layers would probably have speeded up both compaction and fluid outflow from the partly hardened sediments. Pressure would be highest near the surface, causing sediment to be ‘piped out’, that is, removed along the joints where the rock would have been weakest. As the joint opened, channels for both vertical and horizontal water flow would appear. Third, when the Flood waters had receded completely, the groundwater level of the area would not be immediately in balance, and so horizontal flow would be considerable. Acids from decaying organic matter at the surface, and below, would tend to move to just below the water table, where the fastest horizontal flow would be occurring. Solution of newly hardened limestone would occur mainly in horizontal channels just below the water table. Conditions ideal for solution of limestone just below the water table would also be helped by the mixing with the groundwater of these carbon dioxide rich, oxygen poor, organic rich, highly saline waters percolating down from the surface. This would then develop a cave system at a particular level. Fourth, when the excess groundwater had been largely drained away and the caves dissolved out, the water table would then be at a lower level so that the caves would become filled with air instead of water. Such conditions coupled with continued downward drainage of excess surface and nearsurface waters would finally bring the rapid deposition of stalactites, stalagmites, and flowstone in the cave systems. In this model of cave origin, there seems to be no major obstacle to a short time period for the solution of limestone caves. Caves need not have formed slowly over many thousands or millions of years, but could have formed rapidly during the closing stages of, and after, the world-wide Flood of Noah several thousand years ago. The New Book of Knowledge, Grolier Incorporated, New York, 1973, Vol. 3, p. 153. Article: Caves and Caverns. Lange, A.L., Encyclopaedia Britannica, 15th ed., Encyclopaedia Britannica, Inc., Chicago, Vol. 3, 1977, p. 1026. Article: Caves and CaveSystems. Moore, G.W., The Encyclopedia of Geomorphology, R.W. Fairbridge (ed. ), Reinhold Book Co., New York, 1968, pp. 652–653. Article: Limestone Caves; Thornbury, W.D., Principles of Geomorphology, John Wiley, New York, 2nd ed., 1959, pp. 324–331. Steven A. Austin, Origin of Limestone Caves, Impact article No. 79, Institute for Creation Research, San Diego, January 1980. For fuller comments on this subject see Snelling, A.A., and Malcolm, D.E., 1987. 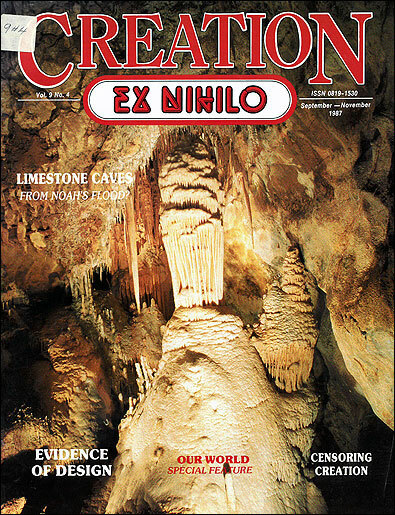 Earth’s Unique Topography, Creation Ex Nihilo (this issue).